These raw materials cannot, or can only partially, be substituted by renewable resources within the next few decades. As such, the efficient recovery and processing of mineral and energy resources, as well as recycling such resources, is now of significant importance. 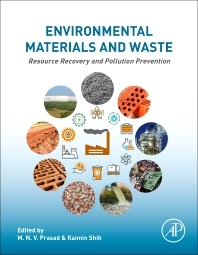 The book takes a multidisciplinary approach to fully realize the number of by-products which can be remanufactured, providing the foundation needed across disciplines to tackle this issue. As awareness and opportunities to recover valuable resources from process and bleed streams is gaining interest, sustainable recovery of environmental materials, including wastewater, offers tremendous opportunity to combine profitable and sustainable production. Dr. Kaimin SHIH is an Associate Professor in the Department of Civil Engineering and leads the Environmental Materials Research Group at the University of Hong Kong. He obtained his Ph.D. from Stanford University and is interested in engineering and employing material properties for innovative waste beneficial uses and environmental treatment processes. Dr. Shih’swork particularly focuses on analyzing the pollutant behavior in solid matrices and at water-mineral interfaces, and has contributes to the research areas of hazardous metals, material resource recovery, persistent organic pollutants, water membrane materials, nuclear waste, and soil remediation. Dr. Shih is currently an Associate Editor for Waste Management, together withthe other several environmental/materials journals. He is a Scientific Advisory Panel member of International Waste Working Group, the president for Overseas Chinese Environmental Engineers and Scientists Association, and the vice-president for Hong Kong Waste Management Association. Dr. Shih has published more than 90 SCI journal papers, edited 2 books, and authored more than 10 book chapters. Further details about Dr. Shih’s research activities can be found at http://web.hku.hk/~kshih/.